I’ve been making the most of the few free days I have before I have to lock myself in the library to finish my thesis, so here’s my first version of Hawthorn! Total cost: around €15,- (€11,- for the pattern, barely anything for the fabric & notions, because they’re left-overs. For this initial version I cut a straight size 2 and put it together without any alterations. I did a quick fitting of the bodice before attaching the collar and everything, but it seemed to be quite fine. I’m pretty happy with the result. It’s an adorable little blouse that went together without any real problems. On the photos it seems to pull a little bit in the back, but that’s probably just how I’m standing. The only thing that I have a problem with has everything to do with me and absolutely nothing with the pattern: I don’t know how to wear it. I’m so used to wearing my shirts tucked into high-waisted skirts, that this new silhouette looks really weird to me. For these quick photos I’ve matched it with a red pencil skirt, which looks nice, but somehow I have the feeling that I look a bit dowdy and matronly (which I know is probably just my perception). I will start wearing it though, because I’m sure it will grow on me when I combine it in different ways. (Please ignore my “straight-out-of-the-shower” face and hair, the sky was getting very cloudy and I don’t think there would’ve been much more light left later). 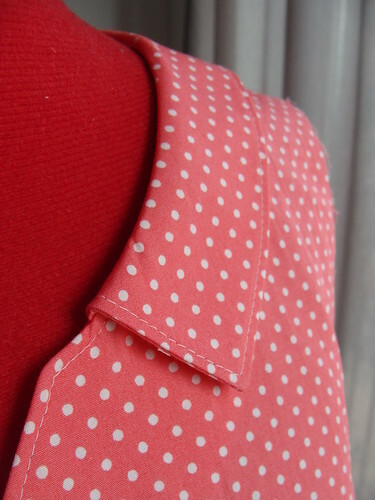 Anyway, I am reconsidering my coral/white dotted fabric for this one. If I already find this version a bit too girly and dainty, I’m sure that will just be too much. 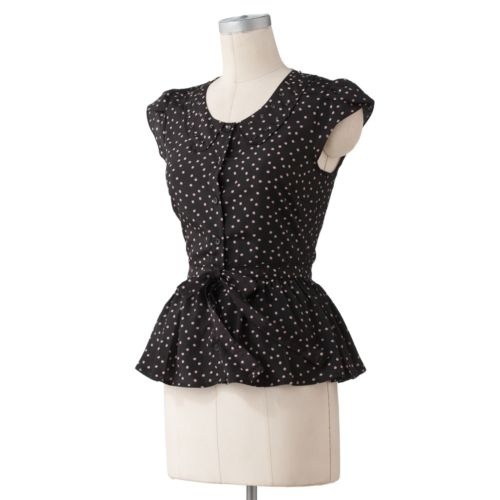 I am going to make a black sleeveless dress version though, because I do really like this pattern. I’ve taken a trip to the fabric market and found my choices for the Hawthorn sew-along! All I’ve planned for now are two blouse versions, but I also have a black eyelet that would look lovely as the sleeveless dress version. It needs buttons and underlining though, so it might not be finished on time. 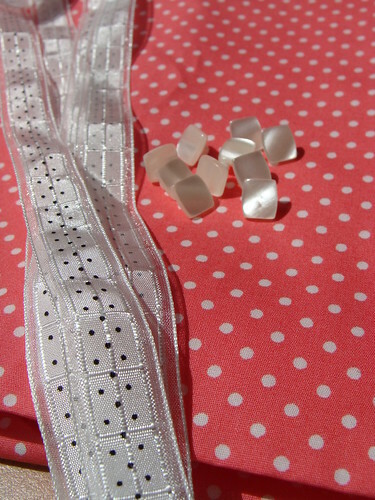 The navy on white dots will be my wearable muslin. It’s an amazing fabric, so I really hope that it fits, but since I already have a blouse made out of it (which somehow didn’t make the blog) it’s no big deal if it doesn’t. I also have a big floral I’m unsure about. It’s white, navy and turqoise and I bought it on an impulse, but I don’t know if it’s suitable for this one… I guess it depends on how much I like the cut of the blouse to begin with. Peplums are a new thing for me, I usually tuck in all my shirts. As of today, I’ve traced and cut the pattern, and am ready to start sewing my “muslin”. I cut a straight size 2, which matches my bust and waist exactly. Because it’s cut very wide at the hips, I decided not to grade up to my usual size 6 from the waist down. Here’s to hoping it fits right the first time around! Right now, I’m thinking of doing lace on the yoke and sleeves, and probably making the whole thing mustard coloured. 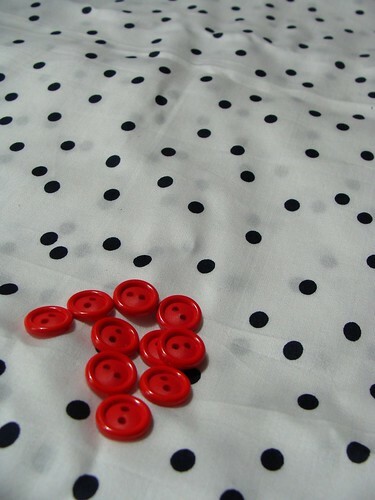 Or perhaps I’ll go for dots, or something else, or whatever I find on the market Saturday! Mixing transparent and opaque fabrics? From Honey mi Honey, but I couldn’t find it on their website anymore. Another take on the lace yoke/sleeves. No idea where this one’s from… People on Pinterest aren’t great with linking to the original source. Can’t go wrong with dots, but perhaps a bit safe? 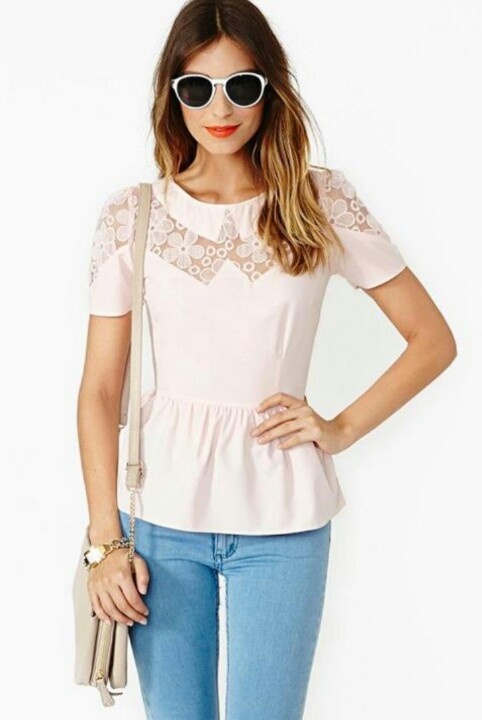 A Lauren Conrad blouse, if the info was correct. Anyway! I’ve decided to give myself a kick in the pants, buy the latest Colette Pattern (Hawthorn) and participate in their sew-along. The pattern is gorgeous, but to be honest the magnificent selection of prizes gave me the final push! Tomorrow I’m going stash shopping to see if I have anything that is suitable and enough, or if I have to make a trip to the market next Saturday. I’m probably going to make the blouse version first,and then a dress version with a pencil skirt. I have fabric lying around for at least 5 blouses and I need more separates! I have managed to finish some pieces over the past weeks, so hopefully the weather will clear up a bit and I’ll be able to get some good pictures soon!